Clara Kathleen “Kay” Smith was born on April 30, 1911. Her first poem, “Twilight Garden,” was published when she was just 14 years old. She studied speech and drama at Mount Allison Ladies College (later Mount Allison University) in 1933. She taught in Saint. John, New Brunswick until 1940, when she moved to St. Thomas, Ontario to teach English and drama at the private girl’s school Alma College. She returned to Saint. John in 1942, where she remained at the Saint John Vocational School for almost thirty years. The author of several books of poetry including The Bright Particulars, At the Bottom of the Dark, and When a Girl Looks Down, Smith was made a life member of the League of Canadian Poets in 1986 and received an Honourary Doctor of letters from the University of New Brunswick in 1988. In 1990 she reveived the Moncton 100 Award for having published the best book in English by a New Brunswick author in the preceding five years, and in 1991 received the Alden Nowlan Award for Excellence in English-Language Literary Arts. 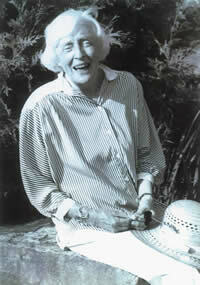 In 1992, the literary journal The Cormorant devoted a special issue to her life and work. Smith passed away on September 18, 2004 after a long illness. Biographical notes written by Elizabeth McKim, courtesy of the New Brunswick Literary Encyclopedia. The sound of muffled thunder in the place between the words. Will blossom for a season like their flesh. in a spell of light. the sudden ascension in fire. All poems published in At the Bottom of the Dark (Fiddlehead Poetry Books, 1978). Used with permission of Mary Lou Joyce. Critical Analysis: Travel and Romance in Kay Smith's "Holland," "Cologne," and "Somewhere after Inssbruck"
Kay Smith’s travel poems explore love and relationships, particularly “Holland,” “Cologne,” and “Somewhere After Innsbruck” from her 1971 collection At the Bottom of the Dark. In these works, unfamiliar setting reflects the unfamiliar emotions felt by the speaker, illustrating a wild abandon in personal liberty. In the work, Smith’s speaker describes the first encounter with her lover: he is a “real magician” (15), she writes, “who could make the dream disappear / with the touch of his very real hand” (16-17). Further in the series, the relationship flourishes, with many of Smith’s symbols and images speaking to an “awakening” (“Cologne”). She writes that “[she] think[s] of ice in springtime breaking in the night”(9), and “dream[s] how soon the winter-punished earth / Will blossom for a season like their flesh” (13). Spring and winter are recurrent throughout Smith’s work, with the former presented as a sign of rebirth and awakening. Bolstered by such images, it becomes apparent that Smith’s speaker is experiencing a stirring within a part of herself previously thought dormant. Thus far, Smith’s poetic narrative has followed a traditional structure. Where she begins to stray from the conventional is in her subtle allusions to personal feelings rather than the physical journey she is on. For Smith, tension is created by the outwardly blossoming love affair and her own inner feelings. This tension continues, as the next poem in the series illustrates anxiety over the lovers’ pending separation. While on the surface the passion between the lovers is growing, Smith’s distinctive poetic voice reveals a nuanced narrative beneath, one which moves in opposition to a more explicit, traditional narrative. This dichotomy adds a layer to the poem that would go unnoticed had the poems not been read as a series; it would be impossible to detect such subtleties in individual poems. It is only after her apprehension is expressed that Smith’s speaker conveys tangible lust or desire. Smith’s “Somewhere After Innsbruck” closes with a consummation of the relationship, as “your eyes look down / into my ferncool darkness / then / the sudden ascension in fire” (4-7). A mutual desire is acknowledged in these lines, foregoing emotional disconnects and anxiety in favour of connection, serving as a climax to the narrative Smith has constructed. Smith, Kay. At the Bottom of the Dark. Fredericton: Fiddlehead Poetry Books, 1971. Print. Kidd, Richard, comp. Changing Illusions. CD. [Includes seven poems by Kay Smith.] 1996. ---. “Afternoon in Late August.” Ed. Mitcham, Alison and Theresia Quigley. Poetic Voices of the Maritimes: A Selection of Contemporary Poetry. Hantsport: Lancelot, 1996. 211-212. Print. ---. “Again with Music.” Compton et. al. Print. 77. ---.“Again With Music.” Mitcham et. al. 209. Print. ---. Again With Music: Seven Poems. Toronto: League of Canadian Poets, 1980. ---. The Bright Particulars. Sel. & ed. Richard Lemm. Charlottetown: Ragweed, 1987. ---. Footnote to the Lord's Prayer and Other Poems. Montreal: First Statement, 1951. ---.“I Cradle a Stone in My Hand.” Mitcham et. al. 204. Print. ---. Modern Canadian Poets. Audiocasette. Toronto: League of Canadian Poets, 1982. ---.“Night Sky.” Mitcham et. al. 203. Print. ---.“The Old in One Another’s Arms.” Mitcham et. al. 201-202. Print. ---. “Old Women and Love.” Compton et. al. Print. 79. ---. “Old Women and Love.” Mitcham et. al. 199-200. Print. ---. “On Sundays in Summer.” Compton et. al. Print. 77. ---. “The One Stem.” Mitcham et. al. 208. Print. ---. “Postscript.” Mitcham et. al. 207. Print. ---. “Remembering Miller.” Compton et. al. Print. 78. ---. “Return to Innocence.” Mitcham et. al. 204-205. Print. ---. “Summer Night, Grand Manan.” Mitcham et. al. 210. Print. ---. When a Girl Looks Down. Fredericton: Fiddlehead Poetry Books, 1978. ---.“Where You Have Never Been.” Mitcham et. al. 206. Print. ---. White Paper Face in the Window. Saint John: Purple Wednesday Society, 1987. “Smith, Kay.” Five New Brunswick Poets. Ed. Fred Cogswell. Fredericton: Fiddlehead Poetry Books, 1962. Banks, Lisa. "Tracing Her Hand: On Finding Kay Smith." Parallel Universe: the poetries of New Brunswick. Ed. Shane Neilson and Sue Sinclair, Victoria: Frog Hollow Press, 2018. 34-48. Print. Cooper-Clark, Diana. “Thin Poems.” Rev. of When a Girl Looks Down, by Kay Smith.Canadian Literature 86 (1980): 108-10. “Cormorant Interview: Kay Smith.” The Cormorant 1.2 (1983): 10-14. Enright, Robert. Modern Canadian Poets. Interview with Kay Smith. Audiocassette. Toronto: League of Canadian Poets, 1982. Frye, Northrop. Rev. of Footnote to the Lord's Prayer and other Poems, by Kay Smith. 1952.On Canada. Ed. David Staines and Jean O'Grady. Toronto: University of Toronto Press, 2003. 96-7. Good, Jackie. “An Unlikely Time, An Unlikely Place.” Interview with Kay Smith. CBC. 17 Aug. 1980. Transcript rep. in The Cormorant 9.2 (1992): 39- 54. Gzowski, Peter. Morningside. Interview with Kay Smith. CBC, Toronto. 10 May 1988. Hall, M. Margaret. “Far from the Noise.” The Cormorant 9.2 (1992): 37. Harry, Margaret. “Missing So Much and So Much?” Rev. of The Bright Particulars, by Kay Smith. The Fiddlehead 157 (1988): 97-100. Hersey, Linda. “Her Poetry has Created a Unique Legacy.” The Daily Gleaner [Fredericton, NB] 4 Sept. 1993: 2. Irvine, Dean. Editing Modernity: Women and Little-Magazine Cultures in Canada, 1916-56. Toronto: University of Toronto Press, 2008. Joyce, Mary Lou. “Kay Smith: A Chronology.” The Cormorant 9.2 (1992): 9-14. Lawlor, Allison. “Grand Manan's Poet of the Heart.” The Globe and Mail 14 Oct. 2004: R5. Lemm, Richard. “She Who Makes Us Jubilate.” The Cormorant 9.2 (1992): 27-8. Lynes, Jeanette. “Close-Ups.” Rev. of The Bright Particulars, by Kay Smith. Canadian Literature 122-3 (1989): 212-15. McKim, Elizabeth. "Kay Smith." New Brunswick Literary Encyclopedia. St. Thomas University, 2011. Web. 31 Mar. 2011. Marriott, Ann. Rev. of Footnote to the Lord's Prayer and Other Poems, by Kay Smith. The Canadian Forum 31.366 (1951): 94. Oliver, Michael Brian. “Tantramar- and Saint John and Fredericton-Revisited.” Rev. of When a Girl Looks Down, by Kay Smith. The Fiddlehead 122 (1979): 115-24. Page, P.K. “Poetry and Mars Bars.” The Cormorant 9.2 (1992): 64-5. Sutherland, Fraser. “Conservatives from the East.” Rev. of The Bright Particulars, by Kay Smith. The Globe and Mail 27 Feb. 1988: C16. Sutherland, John. “A Criticism of 'In League with Stones. '” First Statement 1.4 (1942): 2. Trehearne. Brian. The Montreal Forties: Modernist Poetry in Transition. Toronto: University of Toronto Press, 1999. Tunney, Mark. “Saint John Poet Kay Smith: A Look Behind the Eyes.” The Telegraph-Journal [Saint John, NB] 19 Dec. 1987:39. Welch, Liliane. “Kay Smith's Gift of Light.” Rev. of The Bright Particulars, by Kay Smith. The Cormorant 6.1 (1988): 57-8. Wright, Vivian and William Prouty, eds. Kay Smith. Spec. issue of The Cormorant 9.2 (1992). Secondary sources compiled by Dr. Elizabeth McKim (St. Thomas University).